Shares of Cisco Systems, Inc. (NASDAQ:CSCO) have been on absolute fire since mid-November. Although the company beat on earnings and revenue expectations, year-over-year (YoY) sales fell 1.7%. Still, investors shrugged it off and began bidding Cisco stock higher. Since then, CSCO stock is up more than 17%. Despite the run, some aren’t in a hurry to get too bearish. Specifically, Bank of America/Merrill Lynch analyst Tal Liani remains bullish. He upgraded the stock to buy from hold and bumped his price target to $46 from $37. At the time, his target implied about 18% upside. After a few more days of rallying though, Liani’s target now implies about 15% upside. That’s still a good return for investors who feel they’ve missed their chance with Cisco stock. Don’t forget, Cisco’s dividend also yields nearly 3%. Is $46 Realistic for Cisco Stock? So what exactly makes Liani think CSCO stock can get to $46 in the next 12 months? He contends that, after several years of uncertainty, there’s finally some confidence in Cisco’s transition to software. Do we want a company transitioning to security, subscription revenue and software? Of course! The margins are better and in many cases the revenue is more dependable. It allows for better growth, too. Hardware is bread-and-butter for Cisco. But the transition allows for higher margins and more profitability, which allows for a higher valuation. So what do the numbers look like? We’re one quarter into fiscal 2018 and consensus expectations call for earnings per share of $2.46 on revenue of $48.5 billion. If it comes to fruition, that’s 2.9% earnings growth on 1% sales growth. In fiscal 2019, analysts forecast 5.3% earnings growth and 2% revenue growth. On the surface, these numbers aren’t very impressive. On the plus side though, earnings growth outpacing revenue growth says analysts expect margins to expand this year and next. Further, after eight consecutive quarters of revenue decline (hello International Business Machines Corp (NYSE:IBM)) we’re finally seeing a return to sales growth. 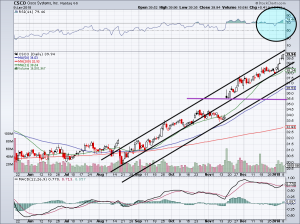 Although margins are expanding, it’s hard to make a really bullish call saying CSCO stock deserves a big premium. After all, we’re talking about sub-5% earnings growth and sub-2% revenue growth in a rolling 24-month period. Now trading at 15.4 times forward earnings estimates, one could argue that the upside is limited in Cisco stock. One could also argue that in a market that seems to drift infinitely higher, there are becoming less and less cheap stocks to choose from. At just 15 times forward earnings, a ~3% dividend yield and expanding margins, CSCO stock is at least semi-attractive. As you can see on the chart, it’s been a pretty sharp rally for Cisco stock. From June through August, it was orderly consolidation. In years past, Cisco tends to slowly churn higher, rather than be an off-to-the-races type of stock. But that’s exactly the kind of price action we’ve got off the charts. While the bullish moves got under way in August, CSCO stock has been exploding since mid-November. On the chart, we have a triple-band collection of trend lines, all in black. This shows where Cisco stock may find support and resistance. For instance, it suggests the near-term upside appears limited. If that’s the case, support could come into play either near $38.50 or down at $36. There’s also the 50-day moving average near $36.50, which should act as support. Further, the blue circle suggests a growing overbought condition in the stock price. 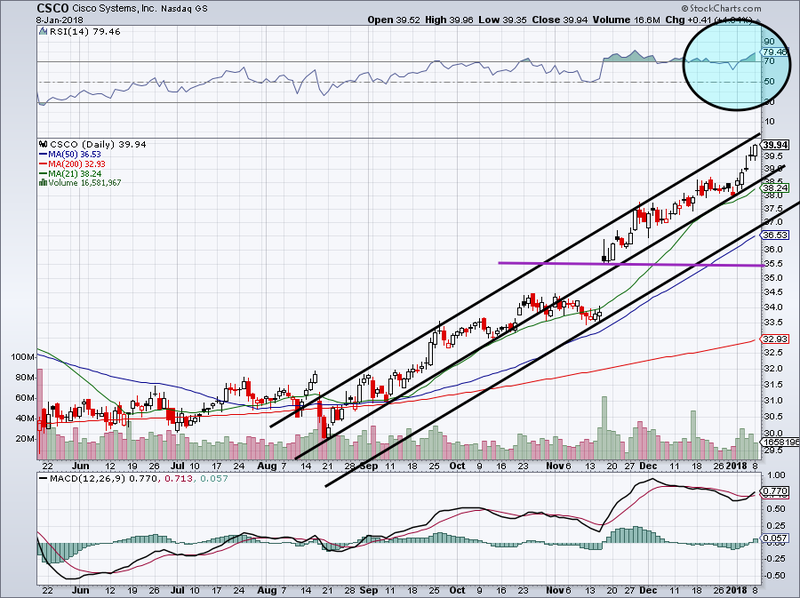 While this is unlikely to lead to an immediate pullback, it suggests CSCO stock will tire sooner rather than later. Finally, there’s the purple line near $35.50. This was the stock’s prior breakout level. So where does that leave us? I would buy Cisco stock on a pullback into support, but not at current levels. There’s a ton of support between $35.50 and $36.50, an ideal level to buy near. When Cisco stock does cool off, it will give investors a solid chance to buy a low valuation, high yield company making a positive transformation. Article printed from InvestorPlace Media, https://investorplace.com/2018/01/csco-stock-massive-rally/.